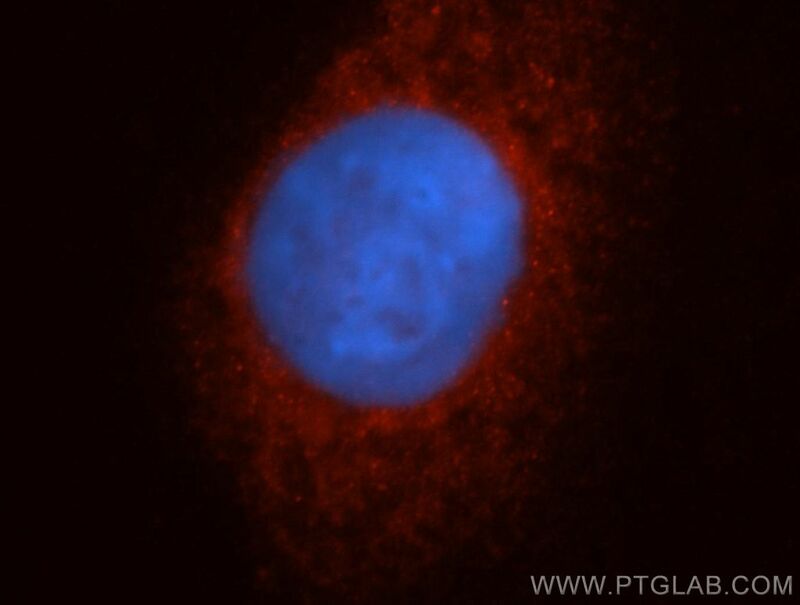 Immunofluorescent analysis of HepG2 cells, using CYP17A1 antibody 14447-1-AP at 1:50 dilution and Rhodamine-labeled goat anti-rabbit IgG (red). Blue pseudocolor = DAPI (fluorescent DNA dye). 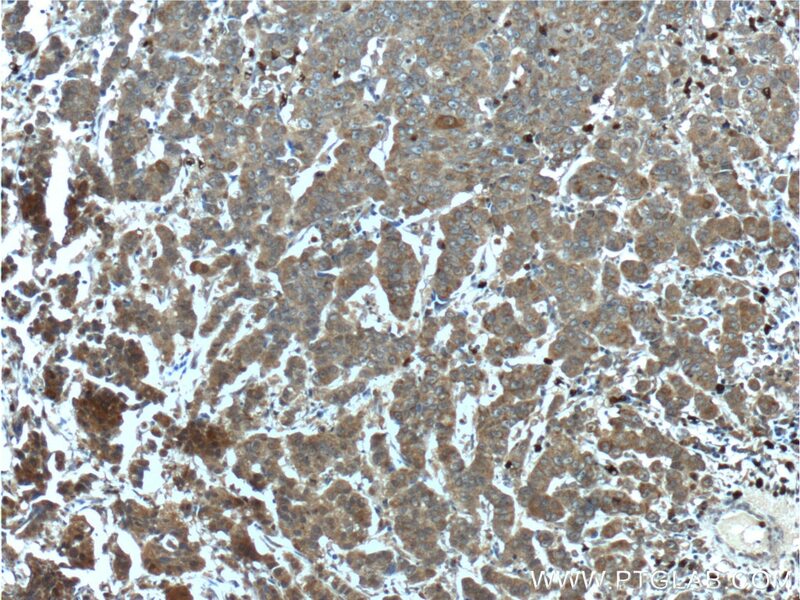 Immunohistochemical analysis of paraffin-embedded human prostate cancer tissue slide using 14447-1-AP( CYP17A1 Antibody) at dilution of 1:200 (under 10x lens). 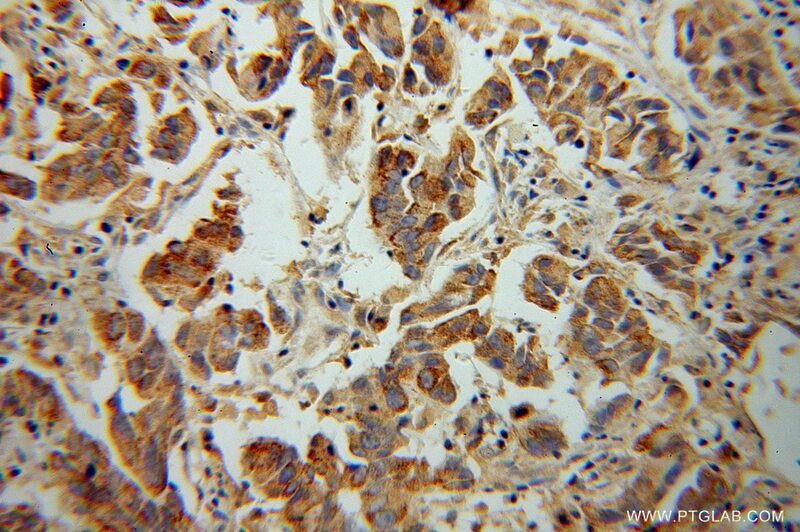 Immunohistochemical analysis of paraffin-embedded human prostate cancer tissue slide using 14447-1-AP( CYP17A1 Antibody) at dilution of 1:200 (under 40x lens). The human cytochrome P450c17 enzyme is encoded by the CYP17A1 gene. It is the qualitative regulator of steroidogenesis in the human adrenals.In its absence, aldosterone is produced in the human adrenal zona glomerulosa .The CYP17A1 gene is expressed in the adrenal cortex and the gonads but not in the placenta (PMID;19403566). Although CYP17A1 has been shown to be a 50-kDa protein, the presence of a lower molecular mass(30 kDa) immunoreactive form in rat Leydig cells was previously shown and it is either a degradation product or a truncated form of the 50 kDa enzyme(PMID:15761033). 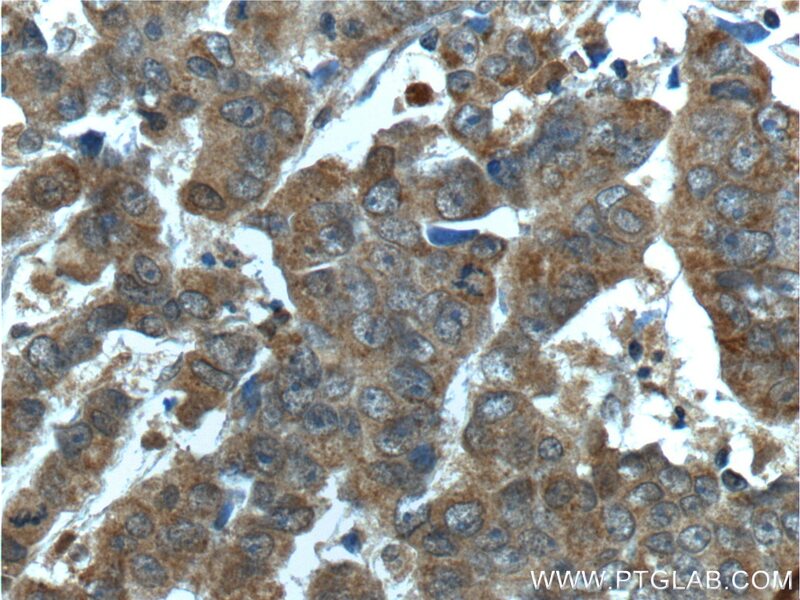 Defects in CYP17A1 are the cause of adrenal hyperplasia type 5 (AH5) and CYP17A1 is an important target for inhibition in the treatment of prostate cancer because it produces androgen that is required for tumor cell growth (PMID 27505042, PMID 27505042). Transgenic GATA-4 expression induces adrenocortical tumorigenesis in C57Bl/6 mice. 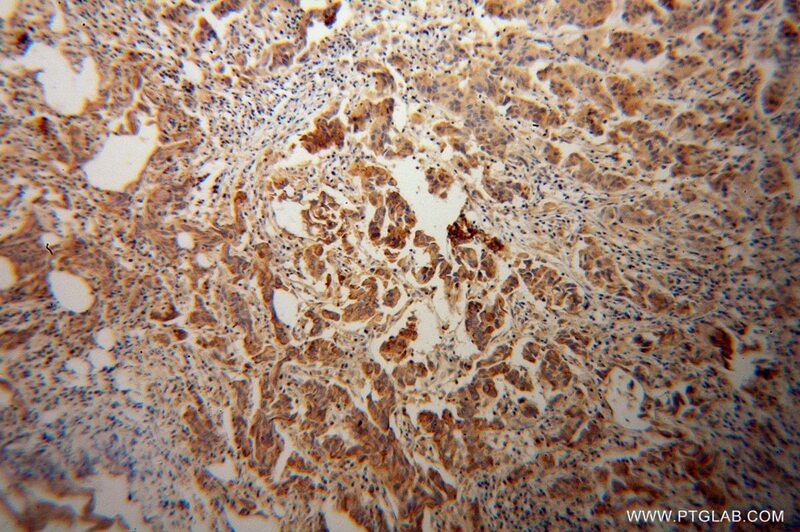 Ectopic cortisol-producing adrenocortical adenoma in the renal hilum: histopathological features and steroidogenic enzyme profile. Intra-tissue steroid profiling indicates differential progesterone and testosterone metabolism in the endometrium and endometriosis lesions. Increased expression of CYP17A1 indicates an effective targeting of the androgen receptor axis in castration resistant prostate cancer (CRPC). Antiandrogenic Mechanisms of Pesticides in Human LNCaP Prostate and H295R Adrenocortical Carcinoma Cells. Hydroxysteroid (17β)-dehydrogenase 1-deficient female mice present with normal puberty onset but are severely subfertile due to a defect in luteinization and progesterone production.